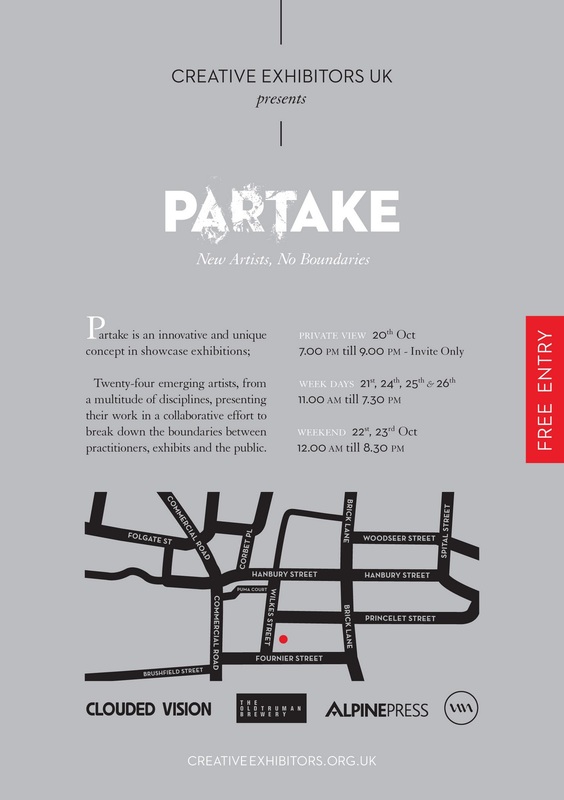 Partake is an innovative concept in showcase exhibitions; twenty-four artists from a multitude of disciplines, presenting their work in a collaborative effort to break down boundaries between practitioners, exhibits and the public. The collective is very participatory so feel free to pop in at any time to get involved or ask questions about the work, there will be artists and designers there all week. There will also be an open 'Project Space' where exhibitors and the public can come together to develop collaborative works and/or develop themes of enquiry. 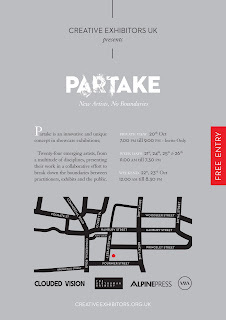 The exhibition runs from 20th - 26th October, 2011, at the Old Truman Brewery, 4 Wilkes Street, London, E1, and is open weekdays from 11am - 7.30pm, and the weekend from 12 - 8.30pm.